Squash House Quilts: Coming Up For Air! Being that you haven't heard much from me lately, I thought I would come up for air and tell you about what I've been doing. I have actually been sewing like I have a job! 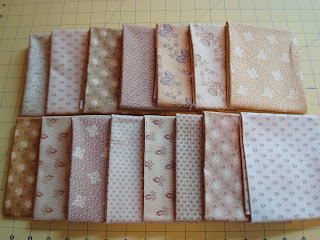 In my last post I showed you some of the cut pieces for Lil's Simpler Tymes Quilt. I began sewing it last week and just couldn't stop. Here is the finished top - ready to feed to Vinnie Gammill! As much as I dislike making square in squares, I must admit I loved working on this quilt! It spoke to me the minute that I saw it. Mr. Squash loves it, too, and says it reminds him of hot chocolate. I'll most likely do an all over pantograph when quilting it as I'm not confident enough yet to do anything special. This is going to be my lap quilt for watching TV in the evenings. Recently these gorgeous Jo Morton fat quarters arrived at the Squash House. This is her new line called "Toasty". Perfect colors for blending! I like them so much that I ordered a second set of fat quarters! I've found that her lines sell out quite fast and if you really like something, you best get as much as you want right after they release! One of my favorite places to shop these days is Sew Unique Creations. I'm sure many of you know of it - somehow I just stumbled onto their website recently and am glad I did! They have a fantastic selection of Civil War fabrics and great prices to boot! The owner, Tara Lynn Darr, also has a great blog here! The other main thing that has kept me from posting are of course learning all there is to know about Vinnie Gammill! He is an interesting creature - very complex and we're glad he's come to stay! The other day I was attempting to set the tension with King Tut in both the top and bobbin. I learned that he just doesn't seem to like King Tut in the bobbin. After a lot of experimentation, I found that King Tut and So Fine in the bobbin are a good combination. So I ordered a nice color of So Fine for the bobbin and this week I should have my first real quilt to show! In the meantime I am still watching Pam Clarke's DVD's on longarm quilting and recently picked up this book called Hooked on Feathers by Sally Terry. She has a really unique way of quilting feathers that I am eager to try on Vinnie! I love the square in a square in a square...I think Mr. Squash House has aptly named Hot Chocolate. Cozy in your chair, knitting/crocheting while sipping hot chocolate. Soon the honeymoon with Vinnie will be over and you'll be like an old married couple. Sorry Mr. SH! Your new lap quilt is wonderful! I can't wait to see how it looks after Vinnie does his magic! 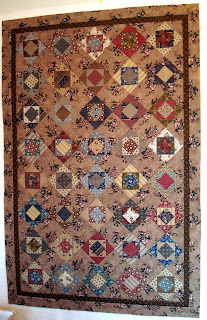 Your Simpler Tymes quilt is beautiful -- it looks so old. The book looks really interesting. I can't wait to see the quilting on your first real quilt. Can't wait to see what you create on Vinnie. Oh Candace. I love your quilt! This quilt totally gets you off the 'posting' hook. It is so ME and my colors. I spent my whole day last Monday at the quilt shop cutting fat quarter bundles of Toasty. You are right, Jo's fabric sells out very quickly and this line will be gone soon. So envious of the fun you are having with Vinnie. Your new quilt is just yummy! 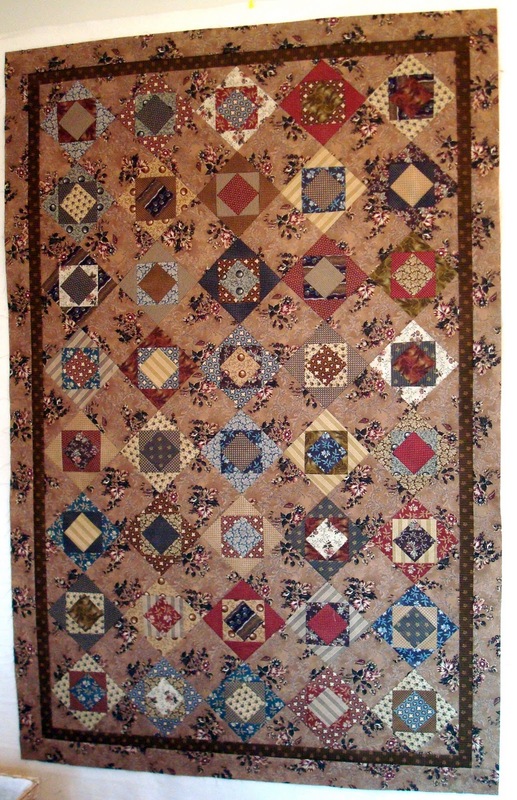 Quilt top is gorgeous!!! I love that website too! :-) I'm so glad you and Vinnie found a good compromise. You are going to love that book. I used to make hooked feathers with my domestic all the time. It's a much more forgiving way to make them and they are gorgeous. Can't wait to see your's!! So pretty, Candace. Your square in a square is absoluely the fabrics that I LOVE !!! And those Jo Morton's - oh my word - I just found those on line at FQS, didn't order them "yet" because of just purchasing the Leader Grips. BUT - I hope to get some of those gorgeous, "Toasties"
Your lap quilt is a beauty, in the most wonderful colours. No wonder you couldn't stop. What a stunning quilt! I love the larger print you used for your alternate squares. The only way I can bear to make square in a square blocks is to make them bigger and trim them down to size. Otherwise, they drive me crazy! I am so looking forward now to doing my own Simpler Thymes quilt. It will most likely be gifted to my grand daughter as it designates one of her semesters of college. I think an overall is perfect for it as it is such a busy quilt. So I can assume we are now having fun! The quilt is gorgeous. I can see why you put the pedal to the metal and powered thru. I love anything Civil Warish. (IS that a word? Hmmm). Can't wait to see how it looks after you work your magic! I love your fabrics for Hot Choc. You are right, an all over panto will be perfect for this quilt. My fav combo of thread is King Tut or Signature on top and So Fine in the bobbin. Or matching SoFine top and bottom. Looks like you are having FUN with Vinnie! Your square in a square is VERY NICE. Good job. Can't wait to see it finished. Beautiful quilt, Candace! It looks very cozy. OOO, I do like your new quilt top. The fabric in the plain squares is really pretty. I have seen the new toasty line of fabric and I think it is really nice too. Great looking quilt! Love the colors. I love to shop at Sew Unique Creations as well! Love your quilt Candace. I know Vinnie is going to be so happy when it gets loaded. Thank you for always being an inspiration! I love your blog and the things you show us! Good quilt! Square in a square blocks always seem to be hard to make. I oversize cut the outer triangles if at all possible. Sirens *** Tsunami *** Evacuate! !